CT Repertory Theatre wraps up its 2011 Nutmeg Summer Series at UConn with the Alan J. Lerner and Frederick Loewe classic My Fair Lady, starring Broadway veteran Terrence Mann, Alix Paige and soap opera star Eileen Fulton done in a less than classic way. In this adaptation from Geroeg Bernard Shaw's play and Gabrial Pascal's film "Pygmalion," Henry Higgins (Mann) is vulnerable, energetic and almost likable instead of the old crotchety, set-in-his-ways professor of language made the standard by Rex Harrison (who created the role on Broadway and went on to star in the film as well as a revival). Mann is well versed as the gruff guy who falls in love in spite of himself. After all, he created the role of the Beast in Disney’s Broadway version of Beauty & the Beast, so maybe he wanted to try for something a little different in this summer theater production choreographed by his wife, Tony-Award nominee Charlotte d’Amboise. Director Vincent J. Cardinal, artistic director and department head, lets him. The result is a Higgins who smiles a lot and who seems to care more about the girl trying to transform herself from Cockney flower girl into a lady who can pass for a duchess at the embassy ball. Mann even left character at the performance I attended and laughed at a particularly funny line from his housekeeper Mrs. Pearce, expertly played by Lynne McNutt. Mann also manages to give Henry a lot of depth, however. His “I’ve Grown Accustomed to Her Face” is moving as he displays the depth of his feelings and surprise at what he has lost when Eliza leaves him. Fulton, looking like a million bucks (playing bad girl Lisa on the soap "As the World Turns" for decades obviously agreed with her) is Higgins’ socialite mother. It’s rather amusing to hear her try to replace her famous southern drawl with an upper-class English accent – surely linguist professor Henry, or fellow dialect expert Col. Pickering (Timothy Gulan) who bets Higgins he can’t transform Eliza’s speech, would catch on to the deception. It all seems to be in good fun, though, with everyone on stage clearly enjoying themselves. Paige throws herself into the role of Eliza with enthusiasm, but doesn’t quite pull off the complexities of a character who transforms from course Cockney girl to "not-quite there yet" in the Ascott scene to refined and polished duchess. She excels as streetwise Eliza and her “Wouldn’t it be Loverly,” backed up by an able harmonizing male chorus, is quite nice. One of the highlights of this production is Richard Ruiz’ excellent turn as Arthur P. Doolittle, Eliza’s abusive stepfather who looks for ways to capitalize from Eliza’s good change in fortune. He’s very funny and lights up the stage. “I’m Getting Married in the Morning” isn’t the show-stopping number here, it’s the one that takes a trip back to what we expect in My Fair Lady: great large-sounding music form the orchestra (NDavid Williams, musical director) and fun, full-stage choreography. D'Amboise makes clever choices and utilizes a larger cast on a small stage well. Kevin Thacker costumes the cast, rounded out by Connor Monroe as Freddie Eynsford-Hill, the blue blood who falls for Eliza, and Michael Anania is the scenic designer. 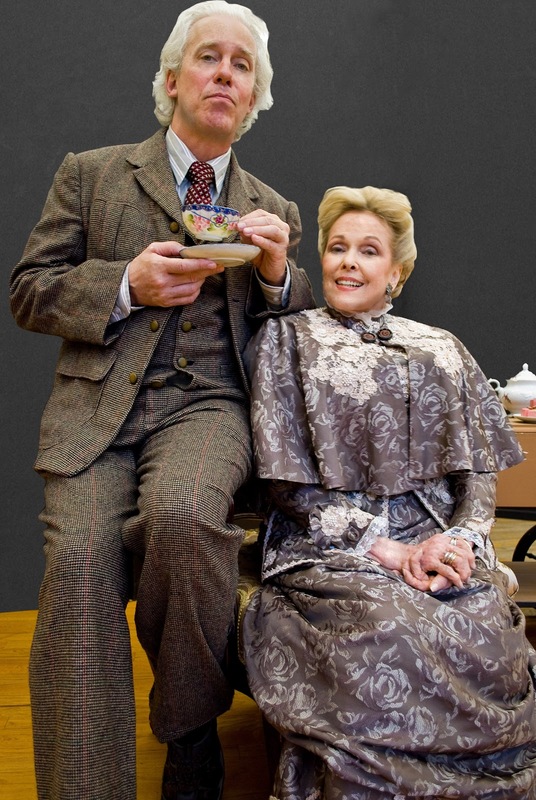 My Fair Lady runs at the Harriet S. Jorgensen Theatre at UConn in Storrs through July 17. For information and tickets, call 860-486-4226 or visit www.crt.uconn.edu.